Without doubt, one of the best compilations of 2013 was Analog Africa’s Afrobeat Airways Return Flight To Ghana 1974-1983. It was the perfect introduction to Ghanaian music and featured thirteen slices of Afrobeat and highlife. This was music that’s irresistible. Uplifting, joyous, spiritual and infectiously catchy, it’s also funky, jazz-tinged, soulful and lysergic. It’s music that has a foot in three decades. It’s influenced by fifties and sixties jazz, sixties psychedelia plus seventies funk. There’s also a twist of rock, gospel and soul. All these influences play their part in some glorious music, music that truly deserves a wider audience. That’s why I decided to Afro-Beat Airways-West African Shock Waves 1972-1978. Released back in 2010, Afro-Beat Airways-West African Shock Waves 1972-1978 features fourteen tracks. This includes music from not just Ghana, but Togo. Among the artists on Afro-Beat Airways-West African Shock Waves 1972-1978 are Uppers International, K. Frimpong And His Cubanos Fiestas, Ebo Taylor And The Sweet Beans, Itadi, The Apagya Show Band, De Frank Professionals and African Brothers Band. With familiar faces sitting side-by-side with hidden gems, Afro-Beat Airways-West African Shock Waves 1972-1978 is something of a musical treasure trove of West African music. What’s more, Afro-Beat Airways-West African Shock Waves 1972-1978 sets the standard for compilations. Just like Analog Africa’s previous other compilations, Afro-Beat Airways-West African Shock Waves 1972-1978 is a lovingly compiled compilation. It’s obvious that the compilations Analog Africa release are a labour of love for Sammy Ben Redjeb. The best way to describe Afro-Beat Airways-West African Shock Waves 1972-1978 is a luxurious and lovingly compiled compilation. It’s contained in a heavyweight cardboard slipcase. Within it are a forty-four page book and separate slipcase which contains the CD. 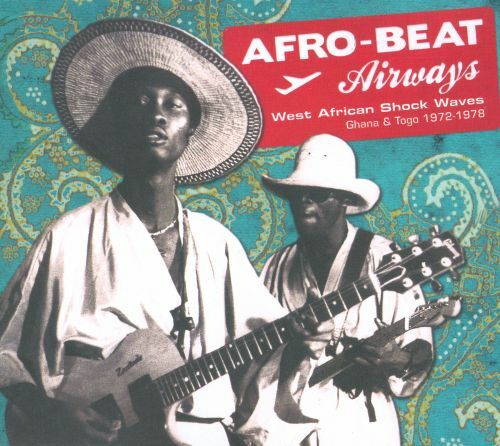 Everything about Afro-Beat Airways-West African Shock Waves 1972-1978 oozes quality. Why though? Within the forty-four page compilation that accompanies Afro-Beat Airways-West African Shock Waves 1972-1978, there are detailed biographies of the artists. These essays are informative and tell you everything you could ever want to know about the artists. Then there’s an interview with Gerard Akueson, who founded Akue, Togo’s biggest record label. He gives a detailed history of Togo’s musical scene, especially between 1972 and 1978. The other thing that makes the sleeve-notes stand out, are the photographs. They’re evocative and give you a sense of the people behind the music. These essays and photographs are part of what makes Analog Africa one of the best reissue companies. Their way of producing compilations should become industry standard. Similarly, Analog Africa dig deeper than other reissue companies. Proof of this is the music on Afro-Beat Airways-West African Shock Waves 1972-1978, which I’ll tEll you about. Opening Afro-Beat Airways-West African Shock Waves 1972-1978 is a familiar face to anyone whose familiar with Analog Africa’s releases, Uppers International. They’re from Bolgatanga in Ghana, and originally, were a covers band. Then gradually, they began to explore Ghanian regional music. Eventually, they were singing in the Dagbani, Huasa and Gurundi dialects. By 1973, Uppers International signed to Polydor, where they released their best known single Dankasa. Both Dankasa and the B-Side Neribe Lanchina feature on the compilation. Dankasa is an Afro-beat classic. It features the vocal of bandleader Chester Adams, waves of Ray Hayford’s Hammond organ, percussion and harmonies. The result is a track that’s funky, jazz-tinged, soulful and dance-floor friendly. The Apagya Showband were innovators. So much so, that they were so far ahead of their time. People didn’t understand their unique brand of Ghana-Funk. Two examples of this feature on Afro-Beat Airways-West African Shock Waves 1972-1978. They’re Ma Nserew Me and Mumunde. Both tracks were recorded between 1973 and 1974. The best of the two tracks is Ma Nserew Me. It’s a slice of organ driven funk, with a vampish, James Brown influenced vocal. During four minutes of uber funky music, The Apagya Showband throw elements of funk, soul and psychedelia into the mix. Forty years after they recorded their lost album, The Apagya Showband’s music is finding the audience it deserves. K. Frimpong And His Cubanos Fiestas recorded two albums. Both were entitled K. Frimpong And His Cubanos Fiestas. Neither album features Me Yee Owu Den. It’s a glorious fusion of highlife, Afro-Cuban, funk and jazz. That’s no surprise. Sometimes, it’s reminiscent of a track from a Blaxploitation soundtrack. The guitars lead to this comparison. Then there’s the blazing, braying horns. They assail you and drive this nine-minute epic along. Along with the vocal and a myriad of percussive delights, this hidden gem reveals its delights. Marijata were a Ghanian band. I’d describe them as a power trio. That’s the case on Break Through, a track from their 1970 debut album This Is Marijata. Released on Gapaphone Records, Break Through features some of the best guitar playing on the compilation. Then there’s the horns and vocal. Along with the rhythm section, they drive this fusion of Afro-beat, funk, jazz, rock and soul along. It’s joyous, uplifting and hook-laden music that’s one of the highlights Afro-Beat Airways-West African Shock Waves 1972-1978. Ebo Taylor isn’t just a giant of Ghanian music, but African music. On Afro-Beat Airways-West African Shock Waves 1972-1978 there’s contributions from two bands he played with. The first is Odofo Nyi Akiyiri Biara from Ebo Taylor and The Sweet Beans. It’s a delicious, dramatic and pulsating fusion of Afro-beat, funk, jazz and rock. His other contribution is Ebo Taylor and The Pelicans’ Come Along. This is a track from their eponymous album. Released on the Abookyi label, it funky, soulful and dramatic, as it unfolds in waves. Sometimes, there’s even a similarity in the vocal to Bob Marley. Both have a similar heartfelt delivery. Orchestre Abass released three singles in Togo during the early seventies. One of them was Awula Bo Fee Ene. It’s a fusion of Afro-beat, funk, jazz and soul. Driven along by the rhythm section and Hammond organ, this is the perfect backdrop for an impassioned, vampish vocal. This is an irresistible combination and is typical of the music being released in Togo during the seventies. Why? Back then, Togo was part of the Islamic funk belt. Sadly, after the release of this track, disaster struck for Orchestre Abass. Members of the band were involved in a car crash, where lead singer Iddy died. However, their legacy is the glorious music they recorded. Live In Other World was the title-track to Itadi’s 1977 album. It’s quite different from other tracks. It has a much more understated sound. That allows the funky wah-wah guitars to take centre-stage. They’re joined by percussion and Hammond organ and drive the arrangement along. Later, a tender, heartfelt and needy vocal enters. Combined with funky, pulsating arrangement, this a heady brew that shows another side to Togolese music. More, which is a track from Rob (With Mag-2), could easily be a track from a Blaxploitation soundtrack. That’s ironic, because Mag-2 were the army band of Takoradi’s second battalion. They play their part in the track’s funky, cinematic sound. Similarities can be drawn with James Brown, when the vampish, ad libbed vocal enters. Stabs of braying, blazing horns join the wah-wah guitars and percussion, playing their part in one of the funkiest arrangements on Afro-Beat Airways-West African Shock Waves 1972-1978. Cos-Ber-Zam released their single Ne Noya in 1973. It was released on the Editions Makossa label and was a huge hit in Togo. No wonder. It’ a real fusion of musical influences and genres, including funk, soul, Afro-beat and even reggae. This was also the only release from Cos-Ber-Zam. Following the success of Ne Noya, Quenum Kokou emigrated to Germany and has never been heard of since. De Frank Professionals released a trio of albums between 1976 and 1978. Afe Ato Yen Bio is a track from their eponymous third album. Released in 1978, it’s one of the highlights of Afro-Beat Airways-West African Shock Waves 1972-1978. With a grinding, funky arrangement and soulful, impassioned vocal, this proves a potent partnership. The only other track I’ve still to tell you about on Afro-Beat Airways-West African Shock Waves 1972-1978 is African Brothers Band’s Ngyegye No So. Formed in 1963, they’ve just celebrated their fiftieth anniversary. No wonder. One listen to the irresistibly catchy Ngyegye No So and you’ll realise why the African Brothers Band have enjoyed such longevity. They’re also one of the most successful Ghanian groups, releasing over thirty albums. So that’s the story of Afro-Beat Airways-West African Shock Waves 1972-1978. Fourteen tracks from Islamic funk belt of Togo and Ghana. This includes contributions from familiar fames like the African Brothers Band, Ebo Taylor and De Frank Professionals. Then there’s hidden gems from Marijata, Orchestre Abass, Itadi and Rob (With Mag-2), the funkiest army band in history. Never before has an army band sounded so funky. It’s one of fourteen reasons why this irresistible genre-melting melange of music deserves a place in your record collection. Everything from funk, gospel, jazz, psychedelia, rock and soul melts into one on Afro-Beat Airways-West African Shock Waves 1972-1978. The result is fourteen delicious and irresistible slices of Afrobeat and highlife. This is music that’s uplifting, joyous, spiritual and infectiously catchy. It’s also funky, jazz-tinged, soulful and lysergic. All these influences play their part in some glorious music, music that truly deserves a wider audience. Thankfully, reissue labels like Analog Africa are doing everything they can to bring African music to a wider audience. This time, it’s West African music and specically, the music of Ghana and Togo. These fourteen tracks are just the tip of the iceberg. There’s so much more music awaiting discovery. That includes the thirteen tracks on Afrobeat Airways Return Flight To Ghana 1974-1983, which was one of the best compilations of 2013. The same can be said of Afro-Beat Airways-West African Shock Waves 1972-1978, which was released in 2010. Analog Africa never let their standards slip. No. Each if their fifteen releases are of the highest quality. Lovingly compiled and luxurious, this is the standard all reissue labels should aspire to. These releases are a labour of love and do justice to the music that Analog Africa’s founder Sammy Ben Redjeb is so passionate about. That shines through on Afro-Beat Airways-West African Shock Waves 1972-1978, which along with Afrobeat Airways Return Flight To Ghana 1974-1983 are the perfect introduction to West African music. Standout Tracks: Uppers International Kankasa, Ebo Taylor and The Sweet Beans Odofo Nyi Akiyiri Biara, Orchestre Abass Awula Bo Fee Ene and De Frank Professionals Afe Ato Yen Bio.